These polycarbonate Elite Bomb Shots offer the all in one way to serve a 25ml of spirit with a 100ml chaser in one glass. These glasses are strong, durable, virtually unbreakable and CE marked making them ideal for use in licensed bars, clubs and events. Reusable bomb shot glass. CE marked at 25ml. Outer chamber holds 100ml. Pour shot in the centre with chaser on the outside. Looking to buy some Reusable Plastic Shot & Bomb Glasses? 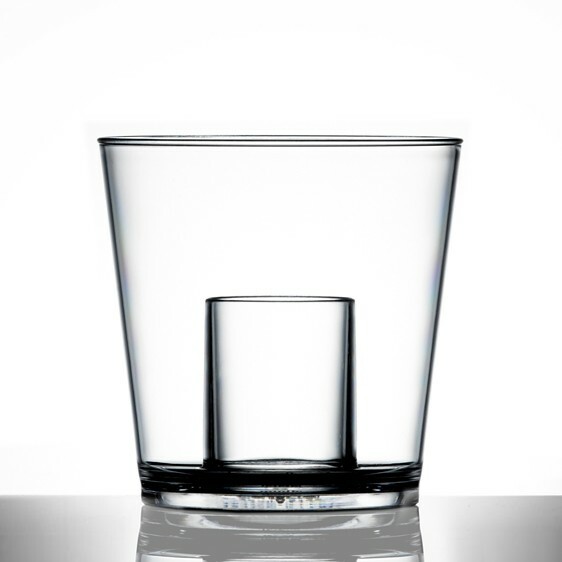 If you would like some advice on purchasing Reusable Plastic Shot & Bomb Glasses, simply contact our expert sales team, giving us either an email or phone number on which to contact you and we'll get back to you with the best advice or contact us by email: [email protected] Phone: 020 8424 8886.